Levenshtein Distance is a way to ascribe a numeric distance between two sequences (often characters in a string or word) by counting the minimum number of insertion, deletion and substitution operations required to transform one sequence to the other. If you think of transforming from sequence ‘a’ to sequence ‘b’ the first recursion represents a deletion from the ‘a’ sequence. The second recursion represents an insertion into the ‘b’ sequence, and the last recursion is either a substitution or a match (and skip over) depending on the equality check. The length is incremented in all cases except where there is a match. When one sequence is exhausted (i.e. length=0) the length of the remaining sequence is added to the result (as either deletions or insertions depending which sequence is left). "Calculate the Levenshtein distance - basic literal code." Note that each sequence is padded with an initial dummy character (blank in this case) to account for the difference between the one-based indexing used in the mathematical equation and the zero-based indexing used in computing. Without this adjustment the indexing gets messy and obscures the relationship with the equation. "Calculate the Levenshtein distance - basic idiomatic code." Both these implementations work and it’s not hard to find many examples of them on the Web (e.g. Rosetta Code) but they scale very poorly. 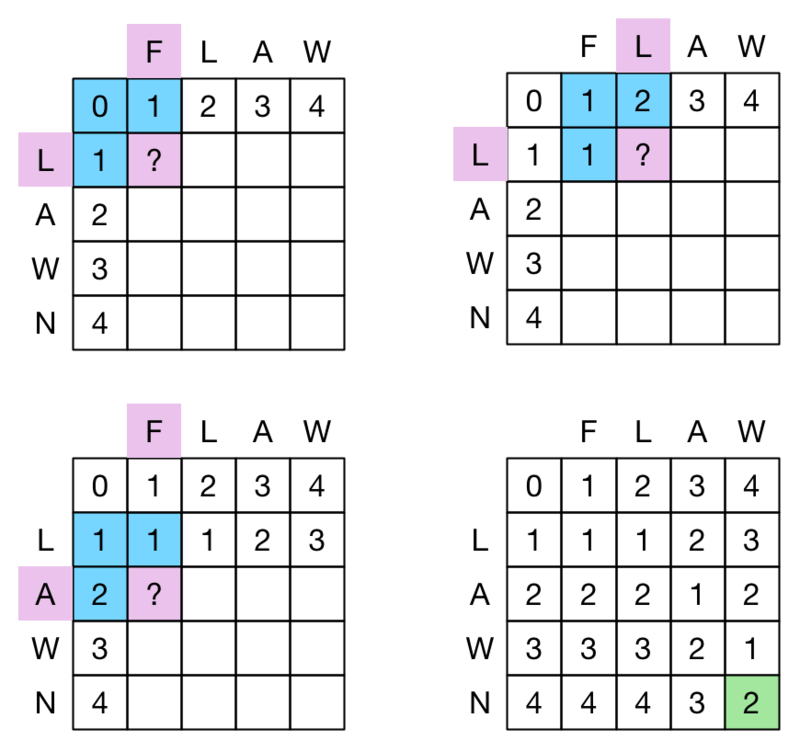 The solution tree grows by a factor of three for each level and the number of levels varies between the length of the shortest sequence and the sum of the lengths of both sequences. The function has a computing complexity of O(3n) which is essentially useless for anything but the shortest strings. Some versions of this code employ ‘memorisation’ techniques in an attempt to improve performance. This helps because many nodes in the solution tree are duplicates which would otherwise be calculated over and over again. However memorisation introduces state and detracts for the functional purity of the solution. It also doesn’t address the underlying scaling problem. Another approach is to use an iterative method based on a matrix representation. This is much more efficient (see below) but it masks the elegance of the original function. Can we improve performance while maintaining the pure functional style of the equation? Two areas for improvement suggest themselves. The first is the fact that as you recurse down the solution tree, the distance returned never reduces (i.e. it only gets larger or remains the same). So processing can stop once the result exceeds a previously calculated minimum. The second is to note that two of the three recursion function calls use the third recursion result as input one recursion later. By passing this result down to the next recursive level, it doesn’t need to be recalculated. We will look at these two optimisation methods below. The idea is to pass an upper bound to the lower levels so that further processing can be avoided once that bound is reached. This is similar (but simpler) to alpha-beta pruning in two-person game trees. In this case, we need only a single alpha (or beta) value. It turns out that this approach provides significant pruning of the solution tree while vastly improves performance. "Calculate the Levenshtein distance - basic with running result." Here the initial call needs to pass the starting length of zero. This code doesn’t improve performance but it allows the result to be tested prior to further calls to lower levels. Because the lower level calls can only ever increase (or keep the same) length, we can stop processing when the result equals (or exceeds) the current known minimum. The following code introduces a fourth argument which holds the current known minimum. This value is updated after each branch is processed to let the next branch know the current best (minimum) value. Also the ‘substitution and match’ branch has been evaluated first because this is the only branch that can return a zero length increment which makes the ‘pruning’ minimum value more likely to be the lowest. This is equivalent to the heuristics applied is alpha-beta pruning where the player’s moves should be ordered with the likely strongest occurring first as this improves the pruning efficiency. "Calculate the Levenshtein distance - upper bound constraint." The code introduces another termination case that tests whether the result (res) equals (or exceeds) the current best minimum (minval). If so, no further processing is performed as it will never improve on the current known minimum. Otherwise the next branch is evaluated with the lowest upper bound from the previous branches being passed on as the new upper bound. By taking advantage of Clojure’s multiple arity function definitions, we can simplify the call to the function by making the 2-arity function call the 4-arity version behind the scenes. This doesn’t change the functionality at all, it just hides some of the plumbing. The revised version is shown below. Note that we can set the minval initial value to the longest sequence as this is the worst case length (requiring every character to be replaced). The table below shows the number of nodes processed by the original and bounded versions of the code for some sample sequences of increasing length. Indicative times are also provided but these are not rigorous benchmarks. It is clear that the bounded version is a substantial improvement over the original version. This is most obvious as the length of the strings increase. However, the bounded version itself can fluctuate significantly depending on the input values as seen by the two highlighted lines in the table above. Here the input strings are the same length but the nodes processed vary by a factor of over 100. The second optimisation approach is revealed by considering the following diagram showing two levels of recursion for the original Levenshtein equation. The (i-1,j-1) term, also known at the substitution term, in the first recursion is also used by the other two terms at the next level down. So some additional optimisation can be achieved by preserving this value and passing it down to the next level. As only four new terms are calculated, instead of six, there should be a modest but noticeable improvement. The modified code adds two new parameters that represent the ‘left’ (i-1,j) and ‘right’ (i,j-1) substitution value previously calculated. The code starts to get a little more opaque but the main theme is still relatively clear. and reuse of the 'substitute' term value." The table below compares the bounded, and the bounded and reuse versions. There is a small additional improvement by reusing the ‘substitution’ value. This is most noticeable where the bounded version works less well (highlighted rows). The ‘standard’ recursive function to compute the Levenshtein distance is elegant but scales very badly, O(3n), which makes it impractical (and dangerous) for most applications. By adding an upper-bound constraint the recursive function can be substantially improved. Some further improvement is achieved by reusing the ‘substitution’ value. These improvements arise by significantly reducing the number of nodes in the solution tree that need to be processed. Levenshtein distance can be represented in a matrix or grid format. One sequence is laid out at the top, horizontally, and the other is laid out to the left, vertically. Each is prepended with a notional ‘null’ entry and the initial distance (0, 1, 2, …) from this null entry is entered in the first row and first column of the grid. When the grid is completed, the bottom right value is the Levenshtein distance between the two sequences. An example is shown in the following diagram (“?” shows the cell to be determined, blue cells are the ones used as input, along with the highlighted sequence entries which are tested for equality). There are clearly strong parallels here between the recursive equation and the grid construction. The big difference between the methods is that the grid construction is at worst O(n2). The grid method also lends itself to an iterative implementation. A simple Clojure iterative version is shown below. It uses two row variables rx and ry that progressively move down the grid. The ry row is built up from the rx row above it, and, its own last lefthand value. Once completed, the rx row is replaced with the ry row and the process is repeated. The performance comparison of the ‘bounded and reuse’ recursive version developed above and the iterative grid version for the same sample set is shown in the following table. In general, the iterative grid version outperforms the recursive version, as you would expect, but the recursive version holds up surprising well at least for typical word-length sequences (less than around a length of 12). This entry was posted in Clojure and tagged Levenshtein. Bookmark the permalink. Levenshtein distance may also be referred to as edit distance , although that may also denote a larger family of distance metrics .